Führerhauptquartier ‘Wolfsschlucht 2’ Flakstellung ‘16’, Margival, Soissons, France. Its there somewhere!!! ----------- Zijn er ergens!!! D61 x 1 R504 Pak-Unterstellraum mit Gruppe (Nr731). [Pak garage]. D62 x 1 100A Unterstand für Maschinensatz 60cm. ---- [Shelter for 60cm machine set]. D63 x 1 L410 Unterstand mit Zugbefehisstelle. ---------- [Command bunker]. D998a/b und d x 3 Baracke. ----------------------------------- [Barracks]. D998c Grube für Baracke. -------------------------------------- [Pit for barracks]. 3 x 2cm Flak 38 AA guns. 100A Shelter for 60cm machine set D62. L410 Command bunker (emplacement for 3.7cm Flak gun but here used as a command bunker only and storage for 2cm Flak ammunition). Base for high flak stand. Margival railway station the search begins. Flakstellung ‘16’ D60 transformer set. Umspannwerk Margival (transformer station Margival). This is not strictly in Flakstellung ‘16’ but you come upon it on the way, it would have powered the area grid of Wolfsschlucht 2 in the event the mains French power went down. There were two units, one here and another in the north. A double set of heavy steel doors. A set of double doors on 030 Vauxaillon. A set of double doors on 030 Vauxaillon inside. The route of the mains power cables today and I believe they took this route in WW2. A twin set of diesel generators. Switch panel on the left and two generator bases on the right. Me shining a light on the subject (Kurt). Later French heat exchanger equipment. Three inlets or out lets on the bunker wall. Flakstellung ‘16’Flakhochstand D997a-c wooden Flak tower. Concrete sockets for a wooden Flak tower. Flakstellung ‘16’ Flakhochstand D997a-c wooden Flak tower. 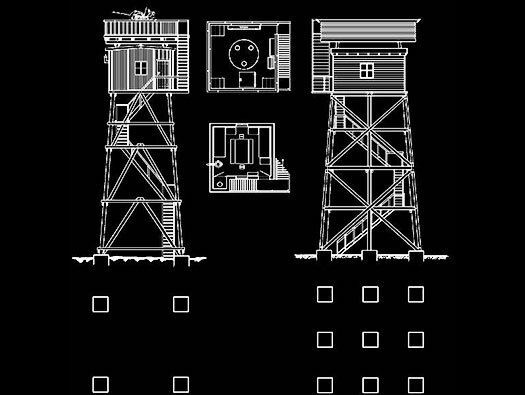 Plan of a wooden Flak tower. 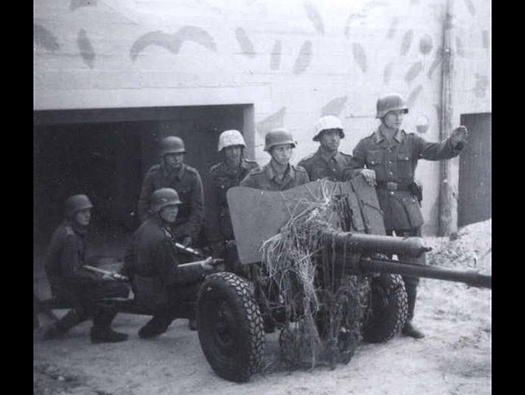 2cm Flak 38 with shield. Six socket Flakhochstand for 2cm Flak 38. Not all the sockets I believe are there so either they were not all used or ??? Flakstellung ‘16’ D62 100A Machine set for a 60cm Searchlight. This like many other Flak sites had a 60cm searchlight to shine on passing aircraft. 100A Machine set for a 60cm Searchlight. A nicely sunken bunker but this type did not have a steel door but either a wooden or a latices type shutter gate.. I think its this style of shutter gate they meant?? Plan machine set for a 60cm Searchlight. Two rooms and outlet cables in the wall recess. The small room may have held the engines fuel. A 19P7 gas tight door with a glass window sealed this small room. Recess in the wall where the electricity connected to the outside and the 60cm Searchlight. A two pin plug by the entrance. The hinge cover still works. A nice find. Flakstellung ‘16’ D61 R504 Pak garage. Panzerjägarstand R504. Pak garage for an anti-tank gun. Paint camouflage is still on the inside where the door should have been fitted. Entrance there should have been some very heavy steel doors but they were never fitted. Pak garage where two U shaped runners for the tyres of the gun to run along and two insets in the far wall. There would have also been small brick piers set along the its length. The space under the gun was to store ammunition. The gun and brick piers. Pak garage showing the brick piers for the U shaped runners and the recess for the gun barrel. In the passage way between the garage and the crew room. to shoot ------- my very bad translation. Four way electrical connection box. Passageway to crew room with a light switch on the wall. Door is a 19P7 type. Drain just inside the door. Zinc drain cover & bowl. 434PO1 door heavy steel double door. Inside the first crew room. The electrical items are left over from when the French Army were here. 422P01 large close combat defence embrasure with a commanders viewing slit as well. Above the embrasure its telling the gunner to put out the lights before opening the slide. Crew enjoying themselves in front of a 422P01. There should be an Anti-gas filter and pump here. And screw in the room filter. Anti gas filter and pump. Pump handle in its box. Looking out of the food store room into the crew room with the 19P7 door The glass has been broken in the small window.. The green panel box is later French Army, the red square in the top right corner is the hole for a periscope. There is also a hook in the roof to hang up a bunk bed. The pipe in the wall I think is a stove pipe. Main bunker entrance 491P2 Gittertür (Screen Door). Machine gun embrasure down the steps covers the entrance. Better view of the entrance. Steel ladder leading up to the roof. Flakstellung ‘16’ D998a Pit for barracks. A pit is dug, some have a blast wall built around them and others just a hole and then a hut of wood or concrete built. Flakstellung ‘16’ D998b Pit for barracks. Flakstellung ‘16’ 223 D63 L410 Flak bunker. More steel ladders on this 223 D63 L410 Flak bunker. Entrance down into the L410 crew bunker. The hinge bracket for the 491P2 Gittertür (Screen Door). On the right a niche for a light switch. Either a light switch or a connection box?? Close combat and the 434P01 door. Close combat defence embrasure type 48P8. Looking into the gas lock. On the left is an aerial slot and I believe not used here. 19P7 light steel gas tight door (the red O on the door). The rubber gas seal around the door is a bit moth eaten. 19P7 light steel gas tight door. Bunker drain and thermoplastic floor tiles on the floor. Straight in front is the power cable inlet, the recess on the right is where water came in and there may have been a small sink to wash in. 19P7 light steel gas tight door. The red O donates its a gas tight door. Another drain and a step to enter the room. Crew room of a straight translation of Bereitschaftsraum is Waiting room or work room I would say. There are several bunk bed fittings for about nine men. The wall with the ring fitting to take spare filters and the mark on the wall where the anti-gas pump was fitted. Another internal 19P7 light steel gas tight door to the Fernsprechraum, telephone room. Anti-gas pump as shown on plan. Bolted to the wall the anti-gas pump and the nice ring to hold spare filters, one filter maybe an anti smoke filter and another anti gas. A 48P8 Close combat embrasure. 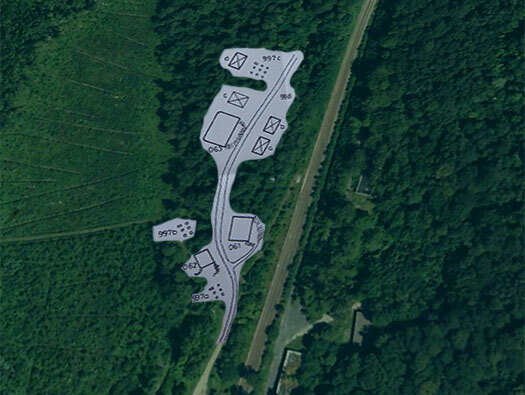 In a standard L410 bunker there was no close combat defence fitted but here at ‘Wolfsschlucht 2’ these were built in. Escape in far wall. There should be a 410P9 escape door now missing. Shutters fitted into the far sots and when removed an infill of small stones needs to be removed before an escape can be used. Telephone room. On the wall were three Festungsfernsprechar Bunker telephones and 3 Batteriekasten battery cases for low voltage use on the telephone line. One of the tree bunker phones that were here. Telephone room. 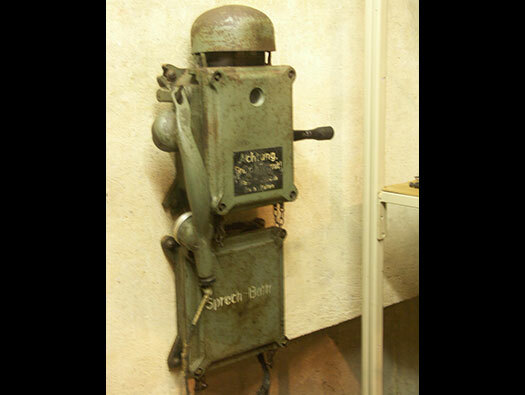 On the wall were three Feldernsprecher Bunker telephones and 3 Batteriekasten battery cases for low voltage use on the telephone line. Flakstellung ‘16’ 223 D63 L410 Flak bunker Telephone room. 2 gr. Kabelendverschluse Gr.II, 2 gr. Cable end cap size II. Power cables into the bunker. Hook for bunk beds. Also original wiring. Back into the Work room. Out to the gas lock. Flakstellung ‘16’ 223 D63 L410 Flak bunker ammunition room. Door to the ammunition room. The 434P01 double heavy steel doors come in left & right. The right fit is standard and some times they needed a left fit. Behind the door was a detoxification cabinet ready to be used if there was a gas attack. This door entered the ammunition room usually for 3.7cm Flak rounds of 3600 in 300 boxes. Here though it was a 2cm ammunition in 480 boxes. This is an F.Pz.G.6026 - 434P01 Linksausf. Left fit.